Disclaimer, we are not trying to advertise for TD Canada Trust, they just happen to be the bank we use. I highly expect that you can find similar accounts and options at any of the big 5 Canadian banks. We have not been able to access our funds using our TD bank cards at any of the ATM’s we’ve come across in Guatemala. The ATM’s all have appropriate symbols indicating both Plus and Visa, but still they do not work. Be warned. We visited our bank yesterday, to prepare our accounts for traveling. There ended up being quite a few things to consider, and the whole appointment took us about 1 hour. Even at that, I felt a bit like we were rushed out the door. Probably because we were referred to a 1-800 number for the remainder of our questions, and the lady helping us was glancing repeatedly at her watch. The first thing brought up by the bank staff, after we explained our travel plans, was ATM fees. Outside of Canada our bank charges $3 for each bank card transaction in the U.S.A. and Mexico. This price increases to $5 for transactions anywhere else. This foreign access fee is on top of the $1.50 fee for withdrawing from an ATM not owned by TD, and whatever the ATM owner decides to charge, so we would have to pay $6.50 per transaction in most countries plus an ATM convenience fee. Now if we were to upgrade to their premium account (called the Select Service account) the bank promises to allow us unlimited transactions, anywhere in the world, without charging us access fees. To get an idea of what this could add up to, let’s assume that we will use this card approximately once a week for the next year to withdrawal cash. At the end of 52 transactions the fee total comes to $338! That was enough to convince us to upgrade. Best of all, the monthly charge on this new account is $0 per month, sort of. We have to keep a minimum balance of $5,000 to waive the normal $24.95 monthly service fee, but we’ll be reserving that minimum amount as a safety net anyways, so not a problem. This premium account comes with a free travel visa. Normally, there would be a charge of $120 + $50 for an extra card annually for this card if you did not have the upgraded bank account to go with it. This card offers us some improvements over our existing no fee visas that give us 1% cash back dividends. Earn points that can be cashed in for any travel expense. The rate works out to 1.5% of all purchases and we should have no trouble finding eligible expenses to cash in our points. Delayed and lost baggage insurance. Trip Cancellation and Interruption Insurance. No need to buy that as an extra. So, all in all, a worthwhile upgrade from our current 1% cash back no fee credit cards. Free safety deposit box. Yeah, how cool is that. Now we have a place to leave things like our birth certificates, copies of our passports, and our Last Will and Testament (when we get around to writing one up). It took almost no time at all to set this up, and you are allowed to designate a deputy to have access. That’s perfect for us, allowing someone at home to access our documentation just in case we run into some trouble abroad. This normally costs $42.50 per year without the account upgrade. Anyone can deposit checks into your account without a signature from you. Handy if you have relatives mailing you checks for your birthday. You simply instruct whoever is collecting your mail to write the following on the back of the check then deliver it to your branch. In the case of TD, you can also mail the check to the branch and it will be deposited. If you need to pay a bill while you are away you can grant Power of Attorney to someone you trust. This enables them to look after your finances while you are away. They can cut checks from your account, request loans on your behalf, etc. I’m not sure if we are going to go this route yet or not. If you have a need for it, you’ll want to find someone you really trust. Once you’ve given out Power of Attorney they can do pretty much anything they want with your bank account. We were also told that we would have to physically come into the branch to remove the Power of Attorney if we had problems. USD$ Account. Our fancy new account gives us a free USD$ checking account. It sounded like a good idea to be able to take advantage of good exchange rates now, by converting some of our CAD$ into USD$. There is one big problem with this plan. You can not associate a $USD account with your Canadian bank card. At least you can’t at TD. This leaves us with no way to access our funds from our USD$ account while on the road. International Calling Numbers. Both our Bank Card and Visa have 1-800 #’s to call if your card is lost, or stolen. Unfortunately these numbers don’t work outside of Canada, so we needed to find out the international numbers to call and bring them with us on our trip. Here’s our general plan for accessing funds while on the road. The bulk of our funds will be stored with the online bank ING Direct and earning a small amount of interest (currently 1.5%). If you are interested in opening your own ING Direct account, feel free to use my Orange Key: 14780906S1 and we can each earn a sign-up bonus. As required, we will electronically transfer funds from ING Direct into our TD Canada Trust account to maintain a balance somewhat higher than the $5,000 minimum to avoid account fees. When we need to make a purchase, we will use our new travel VISA wherever possible and earn our 1.5% reward. We will set up our bank account to automatically pay off the balance of the VISA each month, so if we do not have access to internet banking we won’t be charged any interest fees. If VISA is not an option, we’ll use local currency. To get at it, we’ll use our ATM card in ATM machines to withdrawal from our fee free account. Do you have advice for us? Please leave a comment. Wow! This is some good research! I’ve been searching online for Canadian bank accounts that would be nice for a traveler. I’m not yet ready to leave (I’m still at the “making excuses not to go” phase) but I’ll sure keep TD in mind when the time comes! Hey Lucie, thanks for your kind comment. Sounds like you’ve done your homework! I was shocked at what the cost of banking would look like in our budget – it was looking to be 1% of the budget! Not acceptable. We shopped around and found some good options too – it pays to play hardball. The power of attorney is important and provided us with piece of mind should anything have gone wrong. In the end, we used ours to help us pay a few unexpected bills. We probably could have managed it ourselves but it was nice to have someone to lean on. Cheers! I’ve heard from a few people now that they ended up using power of attorney while travelling. I’ll probably be convinced yet before we take off. Better to be safe than sorry. Finding a bank without fees is HUGE. Our bank told us there would be not international fees charged by them, but what they didn’t tell us is that we are charged 3% every time we take out cash. Our bank claims it is from the international banks, but since it is the same amount every time I’m not convinced. We are getting killed on fees right now, because in addition to the 3%, a lot of foreign banks in SE Asia charge a flat fee or percentage on each transaction (and, in some cases, like in Laos, have a low daily limit, making it necessary for multiple transactions). We try to use our credit card whenever we can (Capital One, with no international fees and travel rewards) but in these cash based economies, it just isn’t possible. One tip you may have heard before is to carry a reserve of emergency cash in USD. It is helpful in the event you can’t access your bank account or use a card, and it also helps to cover things like visa fees without exchanging money before you’ve had a chance to use the ATM. Another thing to watch out for when you travel is the hidden costs of exchanging money. We mostly use the ATM to get foreign currency, but at the end, you almost always have leftover money to exchange. A lot of times they won’t take small change or bills – we lost almost $20 in Croatia that way. Try to use it up when you can. Your absolutely correct. Both our bank and visa will charge a 2.5% foreign exchange fee to convert currency. I’ve looked long and hard, and have not found a Canadian bank that charges any less. Likewise, Capitol One charges Canadians 2.5% for exchange fees. Once again, Canadians get the short end of the stick when compared to our Southern neighbours. Great advice on carrying extra USD and spending all your local currency before you leave the country. Hi Mike and Ashley! Now that you’re home, we’d love to hear any further insights, experiences, etc. with respect to bank fees, ATM accessibility (i.e., did your TD card let you down again after Guatemala? )…or any other money/banking-related issues we should keep in mind?!? Your blog has been an incredible source of information and inspiration…I must admit, when I saw the note that you were back home, I was sad for us all!!! We check every couple of days if there is an update and are always excited to read your latest entry! As for problems with our bank, we did have a few. Guatemala was the only country that we could not access any money at all from. Egypt was the next most difficult. The only bank we found that would accept our card was the Bank of Cairo. Fortunately they have ATM’s pretty much everywhere we went in Egypt, so once we discovered what we were looking for, it was easy to get cash. Our next biggest problem had to do with my card being cancelled while on the road. 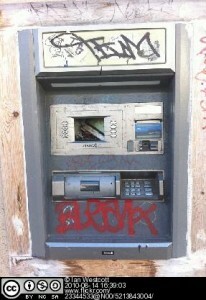 While we were walking the Camino, someone was attempting to access our bank account using my bank card’s information. I’m not sure how, as I had it with me, but the criminals know how, so it happened. TD marked the expenses as suspicious right away and stopped them from going through. I didn’t even know it was happening. They also locked down my bank card. I didn’t discover that my bank card had been locked for a while, as we had been using Ashley’s card for all of our withdrawals. We were trying to pull out enough money in Bulgaria to purchase a car, and to my surprise, my bank card wouldn’t work. I phoned the bank to find out what went wrong and they told me about the 3-months-prior suspicious activity that caused them to lock the card. The problem was that they couldn’t unlock it again. The only way for me to use the card was to phone a pay-by-the-minute number just before using an ATM and having the lock temporarily disabled. I had to call each time I wanted to take out money, and I’d have to wait on hold for up to 20 minutes. In theory I could call the number collect for free, but nobody in Bulgaria had ever heard of making a collect call. So nobody could tell me how to do it with a cell phone in their country. We didn’t typically travel with an active cell phone, so my card became useless for the rest of our trip. I had inquired about having a new card mailed to me, but the bank no longer does that. They only issue new cards in a branch. And, since TD only has branches in Canada, I was out of luck. When we got home, it took about 5 minutes at the customer service desk, and everything was active and working again. Fortunately Ashley’s TD card stayed active the whole time we were away and both of our ING Direct cards worked in every ATM we tried them in. That’s how we got by in Guatemala.